To support its award-winning school communication tool, ParentSquare launches a new ‘ParentSquare’ iPhone app. 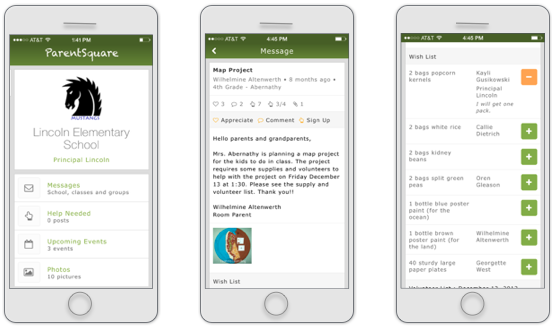 Santa Barbara, CA – September 8, 2014 – To further its mission to improve communication at schools and involve every parent, ParentSquare introduced a new ‘ParentSquare’ iPhone app today. Designed to help schools reach families by whatever communication method they prefer, this app allows parents to check and respond to messages and stay on top of school and classroom activities. In addition, parents will be able to view photos, appreciate messages and sign up to volunteer and bring supplies. Available free of charge on the Apple App Store, the new app makes ParentSquare even easier to use. ParentSquare is free for up to three classrooms per school. Once registered, teachers simply invite parents and can immediately share email and text messages. Future app updates will include features designed specifically for teachers so they can manage classroom communications on the go. ParentSquare is a private, secure communication platform designed specifically for schools. ParentSquare connects families and educators through the ParentSquare website and app – increasing parent involvement and easing school-home communication. For more information please visit http://www.parentsquare.com.